Did you know that assistive technology can be used to increase, maintain, or improve the capabilities of students with special educational needs or disabilities? With the right technology, you can break down barriers to learning and ensure that learning is more accessible to all of your students. When you think of assistive technology, you probably conjure up an idea of tech that needs to be specially made and is going to cost your school a small fortune. But what you probably don’t realise, is that assistive technology is available in most of the tech that you use with all of your students, every day. You just need to learn how to use it in the right way. And once you have, you can open up a world of possibilities for your students with special educational needs or disabilities (SEND), helping them to achieve things which you never dreamed possible for them. To find out about which types of assistive technology best suit each particular area of need, please visit our assistive technology in education mini-site. Microsoft provides accessibility options included in all of their products; enabling your students to access, process and present information in ways that are the easiest and most efficient for them, based on their learning needs. Windows has a central location where you can explore accessibility settings and programs that’ll make your student’s computer easier to use. The Ease of Access center sits in the Control Panel and includes options such as Magnifier, On-Screen Keyboard, and Speech Recognition. Microsoft Office has a really handy feature called The Accessibility Checker, in which you can scan your document, spreadsheet, or presentation and it will identify any accessibility issues and how to fix them. Visual tools such as Office Mix, Sway, and OneNote can help your students find alternative ways of working and communicating. Microsoft hardware such as ergonomic keyboards and mice can be more comfortable for students with mobility and dexterity impairments to use. Whereas Windows touch-screen enabled devices allow your students to navigate their screen without the use of a mouse or keyboard so that they require less fine motor skills. 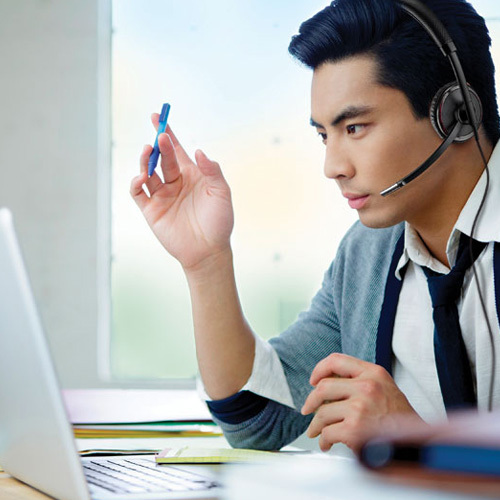 Plantronics headsets can help your students with SEND find their lessons more enjoyable, manageable and productive. They’re made for comfort, and the noise cancellation technology helps students stay focused and at ease; blocking out the unwanted background noise of the classroom around them. Students who are hard of hearing will benefit from being able to listen to an audio clip as loud as they need to, without disturbing the rest of their peers. Students with Attention Deficit Disorder can be highly distractible. Interference from sounds can easily disrupt them from learning. These students may benefit from more focused learning engagement through the use of audio materials. Plantronics headsets can enable students who have difficulty with reading and comprehension to use text to speech software, without distracting the rest of the class. Students with social, emotional or behavioural problems can find being surrounded by people all day overwhelming. Plantronics headsets allow them to shield themselves from the situation, without having to physically remove themselves. Guided access – restrict an iOS device to stay on one app, helping to eliminate distractions for students with attention and sensory challenges. Multi-touch technology – enable students who have trouble with their physical and motor skills to navigate their device using simple and adapted custom gestures which require little force. Text to speech – allow students who have vision impairment, or struggle with reading, to have their text read aloud to them. Students with learning difficulties can improve their comprehension level by following the text as it’s being read. Dictation technology – increase productivity for students who take longer to write or type, whether because of a learning difficulty, or a sensory aversion. Dictation lets them command their device, saving them significant amounts of time and upset. Nuance’s Dragon® speech recognition software enables students with all kinds of physical and learning difficulties to talk to their computer and watch their spoken words appear on-screen. They can also dictate to and control virtually any Windows application – just by speaking. Helps students with physical disabilities gain greater independence as it eliminates the need for a dictation buddy, and empowers them to keep pace with the rest of their peers. They can work virtually hands-free as Dragon learns to recognise their voice, and the text to speech software will even read text aloud to them. Facilitates students with learning difficulties in improving their core reading and writing skills. They’re able to dictate their work, allowing them to focus on quality content rather than the frustration of writing. Plus, watching the words get transcribed and hearing them read aloud helps them better understand spelling and comprehension. Enable your English Language Learner (ELL) students to harness their oral English skills in order to advance their academic writing. The text-to-speech technology lets them listen to text being read aloud as they follow what’s being read on the screen. This can improve both word recognition and pronunciation. Before you go anywhere, make sure you take a look at the Barefoot website to discover inspirational activities that have been specially designed to engage children with SEND. They focus on developing computational thinking core skills in a fun, accessible way and can be easily adapted by you to suit your lessons. I hope you’ve found this helpful and that you’ll begin to better utilise and integrate the assistive features already included in your technology, into your classrooms. Don’t forget, there’s tonnes of information and support out there – you’re definitely not alone in your quest to make learning more accessible! And don’t hesitate to contact us with any questions, either by commenting below or contacting your account manager, or one of our education IT specialists on 0870 429 3020. Previous PostPlantronics’ most advanced noise-cancelling headsetNext PostWhat’s Next for File Transfer Technology?